The latest G20 meeting took place in South Korea, a symbolic recognition of the growing importance of the east both from the venue and from the fact that the G20 itself, containing the dynamic eastern growth countries, is now the main international economic forum. The global imbalances between developing countries which helped to fuel the credit boom remain in place. Tensions over currency valuations between the US and China reflect both the interdependence between the two countries and their long-term divergence. Low interest rates in the US and elsewhere lead to investment money pouring into China. This continues to stimulate the Chinese economy and promotes exports back to the US. This continues to make US exports less competitive. The US tries to combat this through more stimulus to the domestic economy and therefore the requirement for lower interest rates persists. The US would like China to allow the value of its currency to rise, something the Chinese have resisted up until now. While the US continues its slow decline as a global power it remains the only one with a global reach. It also continues to play its role as the global consumer of last resort. 70% of US GDP is consumption based and its recovery from recession is based on increased domestic consumption not exports. Most western economies are struggling to get out of the recession. This has led to a breakdown in international cooperation and the pursuit of what Philip Stephens calls ‘a pinched nationalism’ of countries that have ‘lost confidence’ in their future. The underlying pressure comes from the fact that the major economies have not seen a robust recovery, and countries are pursuing their national interests, defined narrowly. Nowhere is the breakdown of political cooperation clearer than in Europe, whose eurozone countries constitute together the second biggest economy in the world. The long-term contradiction between countries whose currencies are linked but which have separate political systems has come to the fore. Germany, which is the main dynamo of the European economy, has now decided it is no longer going to bail out the weaker peripheral countries, the so-called PIGS. These economies can only exist in their current form on the basis of continued economic support from Germany and other large European economies. This pursuit of a narrow self-interest by Germany could lead to the break up of the eurozone. As Sean Collins has argued, even the kind of limited restructuring that General Motors has undergone in the US, under US government control, is both atypical and probably inadequate to return GM to its dominant position in the car market. The opportunity to take advantage of the new growing markets in developing countries is being spurned due to conservatism and risk aversion. With the exception of the US all western economies are being subjected to austerity packages. While these are being justified on the basis of the need to appease global bond markets there is no doubt that governments really have no idea of what else to do. George Osborne, the UK Chancellor of the Exchequer, recently had to abandon plans to produce a white paper on growth because there were insufficient ideas to put into it. Austerity is the only policy they have, which leads to a decline in domestic demand, a dampening of international trade and probably an increase in protectionism. Austerity policies and the absence of investment has led to a situation that while most economies are now growing slowly, this has not led to an increase in employment. Both free market and neo keynesian economists have been discredited by the recession. Economic debate is now characterised by its pessimism, and a general belief that slow or even no growth in the west is both impossible to avoid and in some cases desirable. The door has also opened wide for those who have psychological explanations for economics, the behaviouralists. David Cameron’s attempt to switch the focus of the economic debate from ‘growth’ to ‘happiness’ is a sign of how bankrupt the economic debate has become. The absence of any political opposition or economic alternative to austerity means that the elites have plenty of room to manoeuvre in managing their domestic economies: indeed, there is even some popular support for austerity measures. On that note I would like to wish you all a merry Xmas and a very happy new year!! 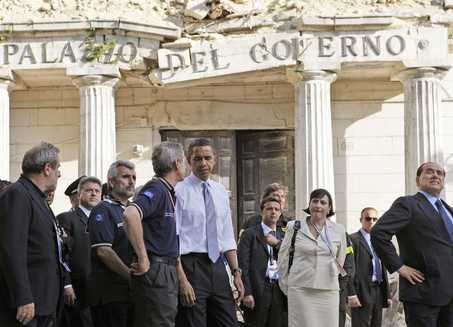 Compared with the drama of the G20 in April, the G8 meeting in Italy is a curiously muted affair. At the end of course there will be, as there always is, a joint statement from all involved saying something anodyne they can all agree with. But the overriding feeling coming out of the meeting is of drift. The leaders gathered together on the site of an earthquake are themselves a curious bunch. For a start the G8 does not include China or India, the two most economically dynamic countries in the world, although the leaders of both countries were there to start with. It includes countries whose presidents are both hugely popular at home, Obama being one and Berlusconi, for unfathomable Italian reasons, the other. Also present by contrast is Gordon Brown, currently on political death row. Whatever their individual current strengths or weaknesses the problems they, and we , face were clearly contentious. Firstly on the economy, there were no concrete proposals nor any clear agrement on what if any steps need to be taken to help the world out of recession. The G8 in this area resembles a group of generals who have sent their troops out to fight and are waiting for news from the front. There is an unmistakable feeling that everything that could be done has been done and now it is time to wait and hope for an upturn. Meanwhile the real underlying tensions between the debtor countries and those supplying the credit continue to simmer away. Secondly, the debate over global warming is following a similar pattern. The main developing countries are objecting to pressure to cut emissions in a way that would hinder their economic growth. This issue is rapidly becoming a source of protectionist pressures in the US which reflects broader tensions between the US and China. Altogether the world’s leaders look unsure and uncomfortable about how to deal with both the near term and longer term problems facing the world. After the G20 – what next? The first line of The Times editorial today sums up what most of us must feel about the G20. The big issues which existed before the G20; the toxic debt problem, the changing balance of world power and the absence of any alternative to managerial capitalism, remain. Beyond that we can only be grateful that the world’s leaders are still all talking to each other and not (yet at least) going down the road to rearmamant and war to settle their differences. The voices of those who encourage austerity and reject economic growth are getting stronger at the same time as developing countries in Africa and elsewhere are experiencing economic disaster as a result of the collapse of world trade. Those of us who believe that economic growth is the basis for human freedom will have a tough task arguing against the new advocates of austerity, particularly as the public debt balloons. In the UK we have to face up to the consequences of having lived beyond our means for the past ten years. But this should not mean that we accept austerity. We need to renew our collective efforts to encourage new kinds of economic growth. It may be that we need to take a long hard look at the huge amount of resources that go into the public sector and decide whether this is all money well spent. There are undoubtedly areas , particularly where the state has invaded the family, where we could do with some savage cutbacks. But overall, cutting public spending only makes sense if any resources freed up are invested productively elsewhere. If you are interested in taking part in a serious debate about the future of the economy, you should attend The Battle for the Economy conference on May 16. We have a great line up of speakers and ample time for discussion about the best way forward. There has been far too little serious debate so far about where we wish to go as a society and we need to change that. This blog is on holiday for the next ten days. Despite all the bad news the sun is out and spring is on the way. Fortunately, as Leonard Cohen said, cheerfulness keeps breaking in. As the G20 leaders begin their deliberations today it is worth trying to assess the problems that face them, and us. Everybody has been competing to describe this recession as the worst since the 70s/30s/black death, yet the full scale of the crisis has yet to be properly discussed. The world is facing three interlocking crises. The recession is severe, but what makes it worse is that it is happening when the coherence and the credibility of the political elites is at an historical low ebb. The coexistence of a political with an economic crisis is what makes this recession so dangerous. The entwining of the political and the economic crises has meant that the world’s response to the recession has been slow and lacking coherence. For example,we are nearly two years into the toxic debt crisis and still the bank bailouts appear to be having very little impact. The weakness and isolation of the political elites has led them to scapegoat bankers, and by extension the whole financial system of capitalism, as the cause of the problem. This has in turn undermined the bailouts of the banks as investors have become wary of being seen to be making money out of the crisis and governments have become constrained about what they can do for fear of upsetting their voters. A key element of the crisis is the changing balance of world power. The imbalance between productive economies like China and the less productive economies in the west lies at the heart of the recession. China and others built up huge financial surpluses which were recycled into consumer debt in the west. Now China is demanding that it be recognised as a new global power and wants to see its economic clout recognised by changes in global institutuions like the International Monetary Fund. The very fact that it is now the G20, which includes China and other developing nations, that are meeting today is a recognition of the shift in the balance of power. But changing the way the world is run will be a tricky process as there will be losers as well as winners. There is an absence of any alternative to the status quo. This may seem an odd thing to say. Why should an absence of any critique of capitalism be a problem for the system? The answer is that in the absence of contestation the global elites have lost their way. For most of the 20th century the west was driven on by its conflict with the Soviet Union. The technological and scientific breakthroughs that came with the space race, for example, came about because of the US’s determination not to let the Soviet Union put a man on the moon first. The absence of opposition of any kind to capitalism today has contributed to a sense of drift and general loss of impetus in society in general and has also affected the political elites. The global elites have themselves begun to lose faith in the market system, so much so that the G20 looks to be dominated by arguments about how much global regulation the system needs. There are other social and natural problems facing the world of course. Huge numbers of people in the world still live close to the breadline. We need to develop new, cheaper and cleaner energy sources. But the three interlocking crises mean that developments in these areas will be held back until politics and politicians themselves are given a new lease of life.